Súbete a la parte trasera del confiable scooter de tu guía y embarca en un divertido recorrido gastronómico por la ciudad. Entre las delicias locales que puede degustar: tortitas rellenas de carne y verduras, caracoles rellenos de carne de cerdo picada y sopa de tallarines de cangrejo. Por supuesto, terminarás la noche con algo dulce. 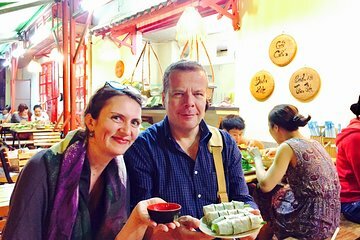 A terrific experience zooming around Saigon on the back of a motor scooter driven by our local foodie tour guide and her offsider. It gave us a very different perspective of the city at night and allowed us to experience great food off the tourist trail. We ate in side streets, shop fronts and roundabouts! Some of the food we sampled included tasty beef wrapped in green leaf and charcoal grilled with a pungent fish sauce deep fried spring rolls seafood delicacies again cooked over charcoal pho local pizza and finally local tea ordered in the street and delivered by scooter! We have done many foodie tours around the world and this one stacks up as one of the best!